DaVinci composite roofing materials are normally delivered to the job site in pre-sorted bundles (by size and color) for ease in handling and installation. DaVinci roofing materials can be installed in temperatures as low as 20° Fahrenheit and are backed by a Lifetime Limited Material Warranty. With multiple colors and widths, isn't there a lot of hand-sorting at the jobsite? Not at all. Each bundle of DaVinci Slate and Shake arrives at the jobsite factory-collated for both roof tile color and roof tile width variations. Simply cut the straps on a bundle and begin installing. I'm concerned that the honeycomb core will show when I cut it. Will it? 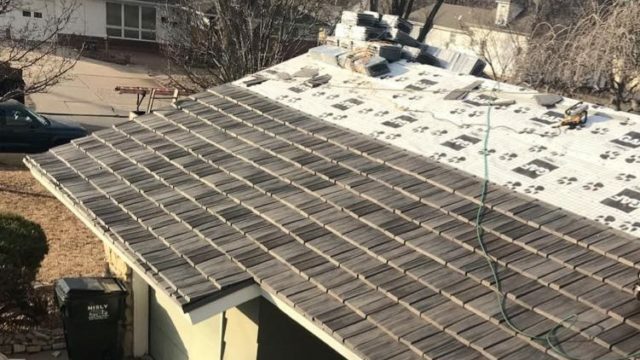 First of all, we have tried to minimize the need to cut DaVinci Slate and Shake with our multi-width tiles by providing five shingle widths in each bundle. 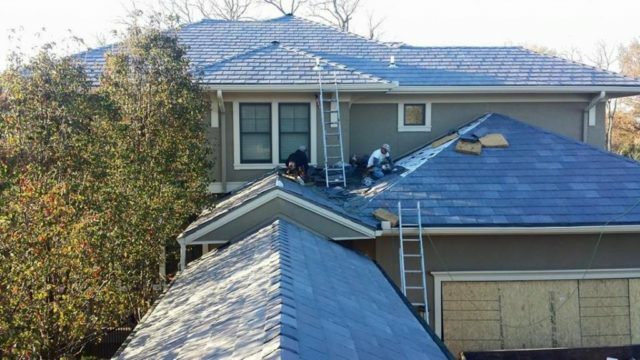 This way, a contractor can easily arrange the shingles to insure that a whole shingle falls on the gable end, thus eliminating any need to make a cut. 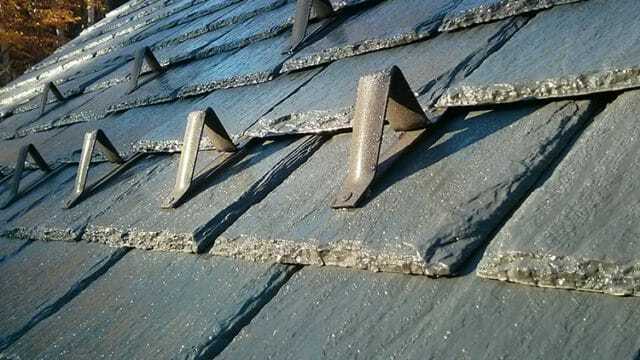 In the rare case where a shingle does need to be cut at the gable end, cuts are made on the inside edge of the shingle. This way, only the finished factory edge is visible from the ground. Solid accessory tiles are also available for our single-width and our multi-width products if the installer prefers. On Bellaforté tile rake tiles are used at the gable ends to insure the honeycomb is not visible. DaVinci Slate and Shake can be installed following standard industry practices. If the contractor follows our installation instructions there is no additional training or special handling required. Plus, because it is lightweight, DaVinci Slate eliminates the time and expense of reinforcing the roof structure that is otherwise required when using quarried slate, concrete or clay tiles. Bellaforté has a simple but unique installation process. Written and video installation instructions are available. Can it be put over an existing roof? 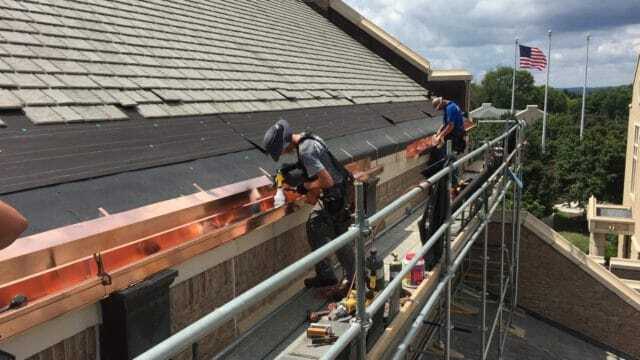 As with most roofing products, the best installation comes from tearing off the existing roof. This is what we recommend for DaVinci products and how all certifications are achieved. DaVinci Slate, Shake and Bellaforté have been successfully installed over three-tab asphalt shingles in the past and have performed well. DaVinci tiles need to be laid on a flat surface to insure completed roof is flat. DaVinci tiles will not hide and in fact may accentuate imperfections in the roof deck. Additionally overlays may not meet local building codes. All DaVinci installations should meet local building codes and standards. Can DaVinci tell me how many roofing squares are on my house? No. Your roofing contractor is the best source for finding out how much roofing material you need for your house. We are happy to answer the questions your contractor may have to assist them. Are snow guards required on DaVinci roofs? Like real slate, snow doesn’t want to stay on DaVinci roofs for long. In fact, snow tends to slide off DaVinci roofs all at once. 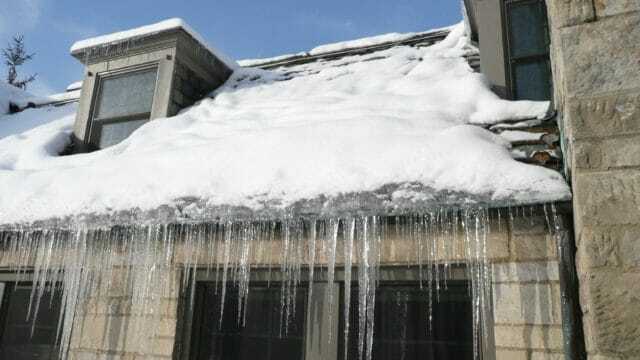 Some homeowners love this feature because it doesn’t allow snow to continually build on their roof. However, in places where people, pets, or landscaping may get in the path of snow sliding from a roof snow guards should definitely be used. If there is a considerable amount of snow it could be quite dangerous. Snow guards are snow retention devices. When installed properly they keep the snow on the roof until it melts. Can electro-galvanized nails be used to install DaVinci tiles? DaVinci recommends the use of copper, stainless steel, or hot-dipped galvanized nails. We realize however that in many climatic regions nail corrosion is not a factor in the long-term performance of the roof system. Therefore DaVinci Roofscapes supports the use of electro-galvanized nails and a system using those nails will be in compliance with the Lifetime Limited Material Warranty. The exception to that is that if the nails fail, any portion of the warranty associated with wind performance would be void.